The very first commercially produced solid body guitar, Leo Fender’s Telecaster began life as the Esquire – a single bridge pickup on the familiar butterscotch blonde ash body. When a neck pickup was added a few months later they renamed it the Broadcaster. But for legal reasons (Gretsch had a drumset marketed as Broadkaster) they removed the decal from the headstock and the guitars became endearingly referred to as a NoCaster. A Fender worker would suggest combining ‘television’ and ‘Broadcaster’ together, and in 1952, the name Telecaster was coined. Leo Fender’s invention caught on quick, despite early calls of it being a “boat paddle” or a “snow shovel”. The Telecaster gave players something to shout about in the early 50s – it was new and unusual, well designed, rugged, easy to play and affordable. It was a stark contrast from the more expensive and labour-intensive electric Spanish guitars Gibson were churning out at the time. Soon, the Telecaster’s unmistakable bite and twang would be heard all over the radios and televisions of the world. 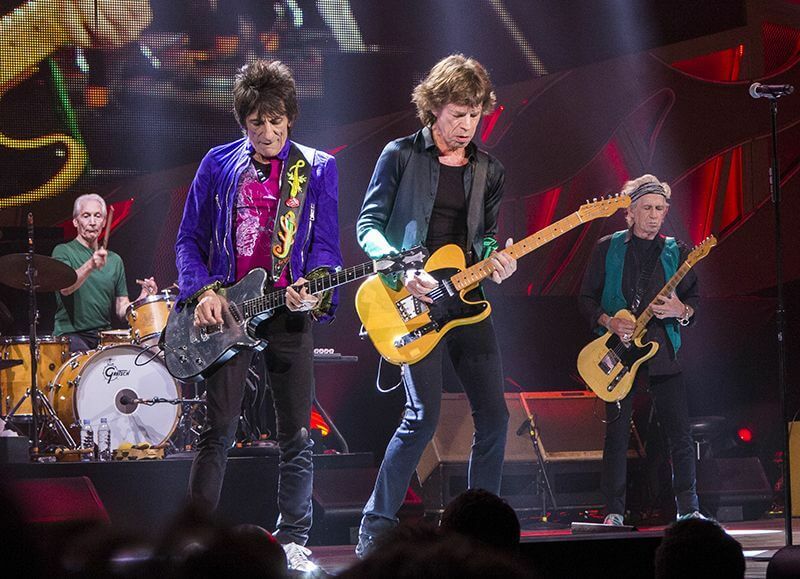 Keith Richards, Danny Gatton, Albert Lee, Jimmy Page, Bruce Springsteen, Bob Dylan, The Edge, James Burton, Waylon Jennings, Brad Paisley, the list goes on and on… The Telecaster is most associated with the sounds of country, but it has been used by artists in almost every genre. Pete Townshend’s heavy-hitting riffs were played on a Tele. Electric blues took shape in the form of Muddy Waters and Roy Buchanan wailing away on a Tele. Joe Strummer’s heavily stickered Telecaster became a 70s punk icon. The Tele was favourites of Jazz players like Bill Frisell and Robben Ford. Even metal players like Jim Root and John 5 used a Telecaster. 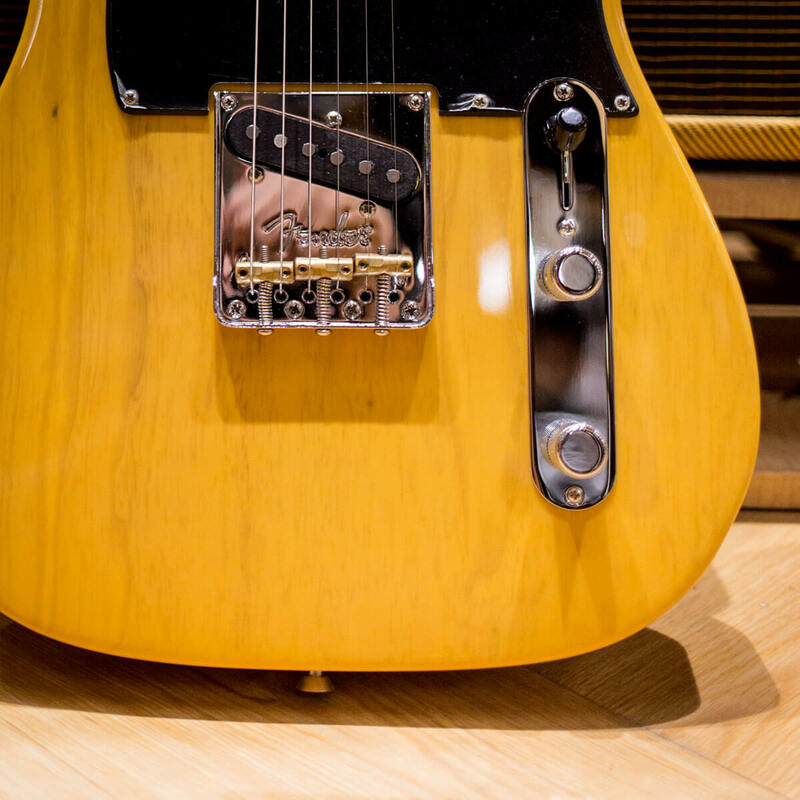 With the Telecaster’s success since its introduction in 1952, Leo Fender set his sights on an innovative new guitar. 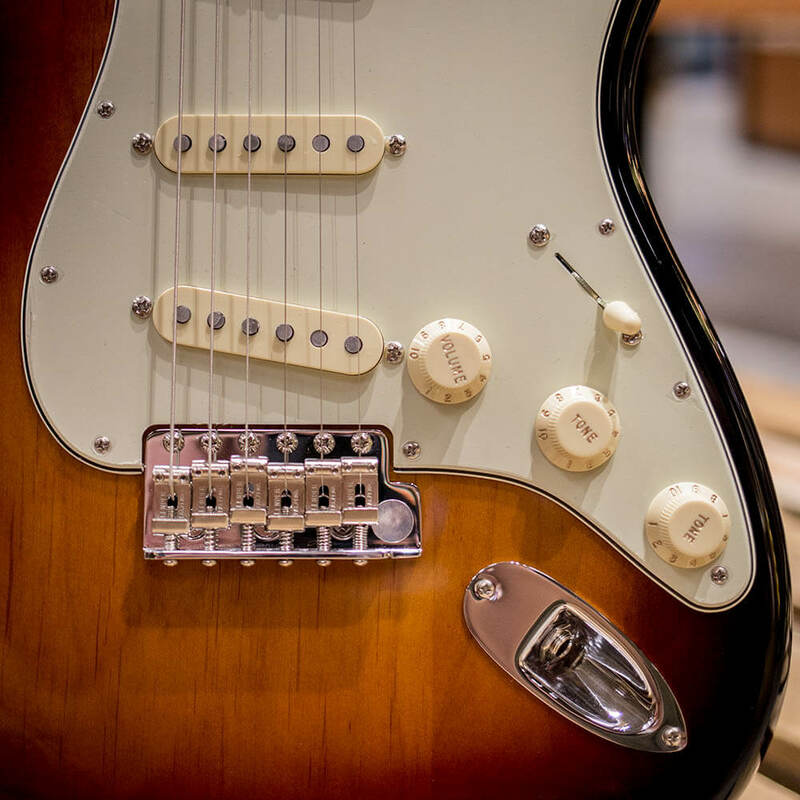 In 1954, the first Stratocasters came off the factory line, and it was a whole different guitar. It had 3 single-coil pickups instead of 2. It had a modern, sleek body with body and forearm contours. A double cutaway for greater fret access. 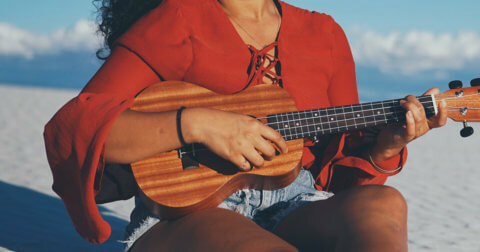 But its greatest innovation lay in the bridge – the vibrato system (technically incorrectly named the ‘tremolo) was revolutionary for the time, producing a shimmering vibrato while keeping the guitar in-tune. 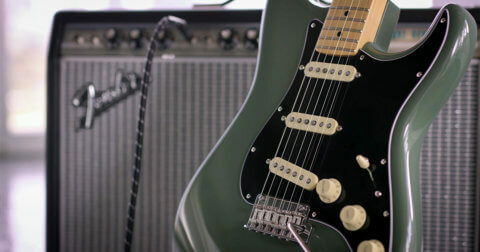 It was over-engineered – Leo Fender designed it for subtle pitch changes, but in the hands of guitarists like Jeff Beck and Jimi Hendrix it produced divebombing, dramatic sounds. The Stratocaster is quite possibly the most recognisable electric guitar ever because of the masses of musicians who have played them. 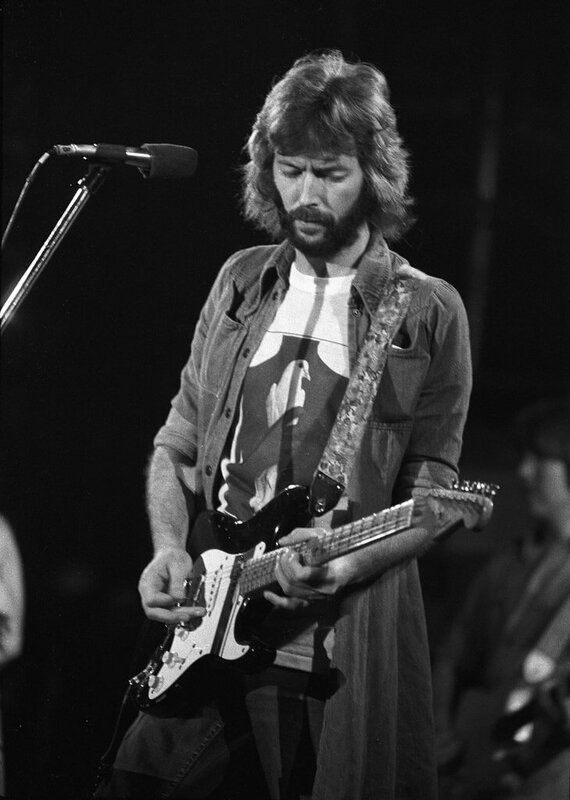 Jimi Hendrix, Eric Clapton, John Frusciante, Buddy Holly, Jeff Beck, John Mayer, George Harrison, David Gilmour are just a small percentage of those who championed the Stratocaster. Like the Tele, the Strat was an incredibly versatile instrument – you couldn’t name a genre where it would be out of place. The 80s saw a rise in modified Strats, with Floyd Rose bridges, higher output humbuckers being installed, creating an all-new category of ‘Super Strats’. Strat or Tele? Which one is for you? We often pick up a guitar our heroes played, we try to emulate their riffs, tone and even their moves. We think that’s a good place to start – nothing is more inspiring than that. But there are key differences that are important to understand, so you know each guitars strengths and limitations. Let’s start with the Strat. Its tone is universally loved and incredibly versatile. You get bell-like, glassy chimes. Position 2 and 4 produce a beautiful sound players call “quack”. Just listen to Mark Knopfler’s Sultans of Swing. 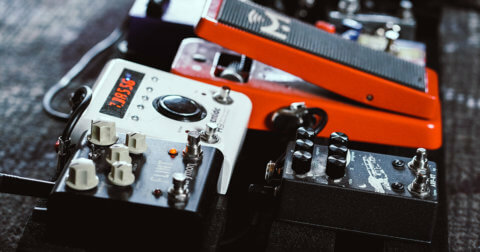 The tremolo is unlike any other – nothing else produces the vibrato flutter like the tremolo on a Strat. The Telecaster’s calling card is its bridge pickup. Combined with the “ashtray” bridge and brass saddles, the bright and cutting tone is what sets it apart. Its twang and snap are unmistakable and it’s no wonder it defined the sound of the country pickers. It’s a tough pick – there are many players who cannot do without either. The most important advice we can give is to play the guitar for yourself – feel the neck, hear its tone and see which one you feel the most comfortable with. 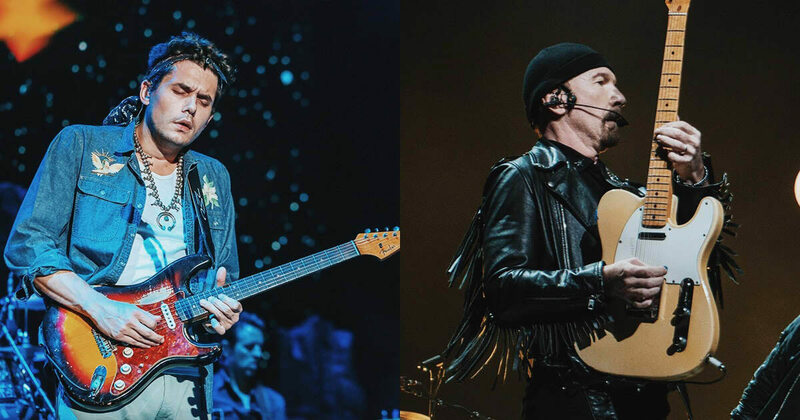 Want to check out these two legendary guitars for yourself? Head down to Swee Lee’s flagship store at the Star Vista, try our extensive range of Strats and Teles and let your next Fender choose you.